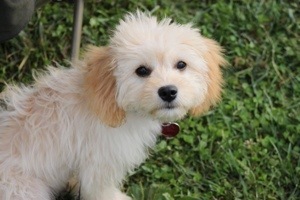 This is “Ashley”, the golden Cavachon from the Maggie litter. He is happy in his new home. We still have 3 of his litter mates looking for their forever homes. Just wanted to send you a couple recent pictures of Ashley who we are calling Tucker. 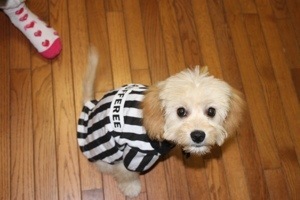 He is watching a soccer game in one and modeling a costume the kids had to get him in the other! He was about 9 1/2 pounds 2 weeks ago and he was 4 months yesterday. He is a great dog – sweet and full of energy. He is great at tagging along to kids practices and games and anywhere else we take him. He loves the car and is always a huge hit with everyone who sees him. He loves dogs – especially big ones. He just had a little clean and tidy (face trim, sanitary clip, etc.). His coloring is still quite golden and he actually has “stripe” down the middle of his back that is darker than it was when we got him – closer to his ear coloring. Hope you are doing well after the move! Always happy to hear updates on the puppies! Thank you K, for sharing! This entry was posted in Adopted Puppies, Buyer Feedback, Golden/Blond, Maggie. Bookmark the permalink.